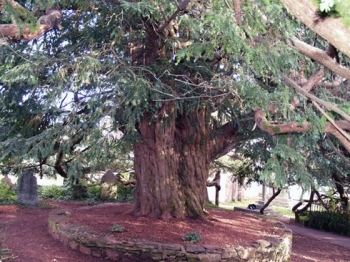 The oldest yew tree is recorded in a churchyard in Perthshire ( Fortingall) with an age between 2,000-4,000 years old. The yew tree is an evergreen long living tree, and native to Britain, with the power to self generate, as it reroots itself. The trunk hollows out after time, and its bark is reddish brown with purple tones which peels. Some of the oldest yew trees we have are over the common age which is 400-600 years old. The oldest yew tree is recorded in a churchyard in Perthshire ( Fortingall) with an age between 2,000-4,000 years old. Mature trees can also grow to 20m. Nether Alderley’s St Mary’s church has an old yew tree known to be 1,200 years old. Straight small dark green needles green grey underside with pointed tip. The birds that nest in these trees are our smallest, such as goldcrest and firecrest. These red pinkish berries are toxic with a poisonous kernel, though the fleshy part of the berry can be eaten by blackbirds, Mistle thrush or song thrush. Squirrels and dormice also find this part of the berry appetising. Once used for the longbow, and is still used for dense easy to maintain hedges. The yew tree fairy is the oldest of the tree spirits and the hardest to understand, with a connection to the Eternal. As it is known as the forbidden tree ( from the garden of Eden story) With ancestral knowledge, it brings change, reincarnation, death and rebirth. The fairy is said to help bring you closer to loved ones who have passed on. Grave yards are common places to find yew hedges and trees, planted by the druids for sacred ceremonies. The same sites were then used by Christianity. The young needles are used for chemotherapy in the cure of cancer, and in the past the none poisonous part was sometimes used as a laxative and diuretic. We know trees are the earth’s lungs, climate regulators and able to support the homes of birds, insects, and some species of animals. Trees give and sustain life in many ways, and our ancestors have valued this fact. Transition Wilmslow have some expert people with a developed sense of awareness as to the role trees play in our lives: and seek to bring this knowledge into focus for the health and well being of this and every area of Britain. Have been promoting education and the management of trees, bringing to our consciousness the wonder, beauty, and health benefits of just what marvellous gifts of life trees are in Britain.